Physicians’ Elemental Diet Dextrose Free is an elemental powder medical food formulated to provide dietary management for patients who have limited or impaired capacity to digest, absorb, or metabolize ordinary foods or certain nutrients. Physicians’ Elemental Diet Dextrose Free is a strictly hypoallergenic formula with a well-tolerated flavor and is formulated to provide the same dietary management as Physicians’ Elemental Diet original, but without the dextrose as a carbohydrate source. Physicians’ Elemental Diet is intended for use under medical supervision for the dietary management of patients who have limited or impaired capacity to digest, absorb, or metabolize ordinary foods or certain nutrients. Physicians’ Elemental Diet is a strictly hypoallergenic formula with a well-tolerated flavor. 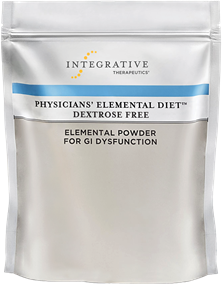 Physicians’ Elemental Diet Dextrose Free is intended for use under medical supervision for the dietary management of patients with GI dysfunction. Specifically formulated to contain free amino acids, partially hydrolyzed carbohydrate, and medium chain triglycerides to aid in their absorption from the GI lumen. Designed to maintain nutritional sustenance as a sole source of nutrition for up to four weeks. Produced as a strictly hypoallergenic formula, free from yeast, wheat, gluten, dairy products, fructose, sucrose, lactose, disaccharides, sorbitol, mannitol, xylitol, artificial colors, flavors or preservatives. Physicians’ Elemental Diet Dextrose Free should be used for 2-4 weeks. It was designed to maintain nutritional sustenance as a sole source of nutrition, and can be used as a half-elemental diet making dosing dependent upon the caloric needs of each patient. One scoop of Physicians’ Elemental Diet Dextrose Free = 35 grams, and 150 calories. Each 1,260g bag contains 36 scoops (5,400 calories). Learn more about determining caloric need. 1. Gorard, DA, Hunt, JB, Payne-James, JJ, et al. 1993. Gut. 34:1198-202. 2. O'Morain, C, Segal, AW, Levi, AJ. 1984. Br Med J (Clin Res Ed). 288:1859-62. 3. Ueno, F, Matsui, T, Matsumoto, T, et al. 2013. J Gastroenterol. 48:31–72. 4. Verma, S, Kirkwood, B, Brown, S, Giaffer, MH 2000. Dig Liver Dis. 32:769-74. 5. Yamamoto, T, et al. 2005. Inflamm Bowel Dis. 11:580-8. 6. Zoli, G, Carè, M, Parazza, M, et al. 1997. Aliment Pharmacol Ther. 11:735-40. 7. Van Citters, GW, Lin, HC. 2005. Curr Gastroenterol Rep. 7:317- 20. 8. Bures, J, et al. 2010. World J Gastroenterol. 16:2978-90. 9. Pimentel, M, et al. 2004. Dig Dis Sci. 49:73-7. 11. Fisher, RL 1999. J. Nutr. 129:252S–5S.. Thoroughly mix each heaping scoopful (35 g) in 4-8 oz. (118-236 mL) chilled or room temperature water. Additional water may be added to the mixture or consumed separately as desired. Consume the mixture slowly over a period of 15 to 60 minutes or more, dependent upon individual comfort. Once mixed, any product that is not consumed after 60 minutes should be refrigerated for a maximum of 24 hours, then shaken or stirred prior to consumption. After opening, store remaining powder in a dry place at room temperature. Protein (Contains 7.5 g free form amino acids per 36 g serving). Also contains no dextrose, sorbitol, mannitol, xylitol. Not intended for use in children. Physicians’ Elemental Diet™ Dextrose Free is a 100% free form amino acid-based powdered elemental formula intended for distinctive nutritional requirements. Physicians’ Elemental Diet Dextrose Free requires minimal digestive functionality for assimilation. Physicians’ Elemental Diet Dextrose Free formula provides 150 calories per serving, distributed as approximately 20% protein, 60% carbohydrate and 20% fat. Packaged by weight, not volumne. Settling of contents may occur. How long can Physicians' Elemental Diet Dextrose Free be used as a sole source of nutrition? Physicians’ Elemental Diet Dextrose Free is designed to maintain nutritional sustenance as a sole source of nutrition for up to four weeks. Typical use is 2-3 weeks in duration. Physicians' Elemental Diet Dextrose Free can also be used in certain applications for just a few days. Longer use (beyond 4 weeks) of Physicians' Elemental Diet Dextrose Free may be used in “half-elemental diet” scenarios, in which 50% or less of calories come from the elemental formula, and the remainder from food sources. Does Physicians’ Elemental Diet Dextrose Free contain modified cornstarch or maltodextrin derived from corn? No, Physicians’ Elemental Diet Dextrose Free contains no whole proteins. Physicians’ Elemental Diet Dextrose Free does contain 7.5 grams of free-form amino acids per 150 calorie serving. Is Physicians’ Elemental Diet Dextrose Free hypoallergenic? Yes, Physicians’ Elemental Diet Dextrose Free is strictly hypoallergenic and does not contain yeast, wheat, gluten, dairy products, fructose, sucrose, lactose, disaccharides, sorbitol, mannitol, xylitol, artificial colors, flavors, soybean oil, soy lecithin or preservatives. What are the dosing recommendations for Physicians’ Elemental Diet Dextrose Free? Physicians’ Elemental Diet Dextrose Free is designed to be used according to an individual’s caloric needs. How quickly should Physicians' Elemental Diet Dextrose Free be consumed after mixing? It is recommended that a serving or meal of Physicians' Elemental Diet Dextrose Free be consumed over 15-60 minutes, similar to a whole food meal. Slow consumption delivers smaller amounts of glucose over time and allows more time for glucose to be absorbed by the body higher in the intestine. Are there any drug or nutrient interactions with Physicians’ Elemental Diet Dextrose Free? Physicians’ Elemental Diet Dextrose Free is a medical food intended for use under medical supervision. Caution should be taken whenever recommending or consuming medical foods. Healthcare professionals can use this drug-nutrient interaction checker to view potential interactions with the ingredients of Physicians' Elemental Diet Dextrose Free. Patients using an elemental diet should follow their practitioner's recommendation regarding prescription medications and supplementation. Can Physicians’ Elemental Diet Dextrose Free be mixed with liquids other than water? Physicians’ Elemental Diet Dextrose Free is designed to be mixed with water. Other liquids may contain intact proteins and/ or carbohydrates, thus changing the careful balance of macronutrients. Can I add more water to Physicians’ Elemental Diet Dextrose Free? Yes. The recommendation of 4-8 ounces of water per scoop was designed to optimize product palatability and consistency; however additional water or ice can be added based on individual preference. There is no fluid restriction while on an elemental diet. Additional water can be consumed after taking the product for individual comfort or level of thirst. Can Physicians’ Elemental Diet Dextrose Free be used for enteral tube feeding? Physicians’ Elemental Diet Dextrose Free is not designed nor tested in enteral tube feeding settings. Is Physicians’ Elemental Diet Dextrose Free safe for children? Physicians’ Elemental Diet Dextrose Free is not designed for use in children. Developmental needs of micronutrients and macronutrients vary and Physicians’ Elemental Diet Dextrose Free is not for use as sole nutrition in children. Is Physicians’ Elemental Diet Dextrose Free a vegetarian formula? We do not label Physicians' Elemental Diet Dextrose Free as “vegetarian” because the Vitamin D is sourced from sheep wool. Our labeling definition for “vegetarian” aligns more closely with the common definition of “vegan” and therefore, we do not consider it to be a vegetarian product.